Anyway, I finished the closet late last week and had a few boxes of things to get rid of. We also had several boxes in the basement that needed to go as well. We were planning on donating it, but we decided at the last-minute to have a little yard sale first. So this morning, we got up at a ridiculously early hour and began unloading boxes onto small tables on our front yard. 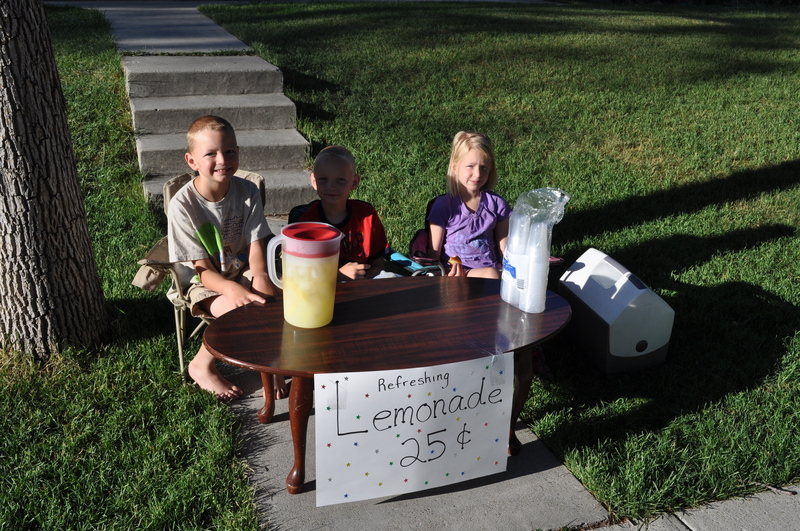 The kids wanted to do a lemonade stand, so they were out on the sidewalk in front of the house. I never imagined we would be so successful! We sold a lot of our items! We were even able to pack it all up just past noon because there wasn’t that much left. We loaded up the remaining boxes and headed over to the local thrift store for a donation. I feel so much lighter! We still have a lot more stuff than we need, so we might end up doing another sale before summer is over. The kids did great with their lemonade stand also. They charged $.25 a cup and then split their earning equally three ways. They each walked away with $6.50! Not too bad for a mornings work. This entry was posted in Crazy Kids, Daily Life, Random Thoughts and tagged cleaning out, donations, lemonade stand, postaday2011, yard sale. Bookmark the permalink. Great stuff Mariah..One persons junk is always someone elses treasure of that you can be sure. I like thrift stores, also. Especially for kids clothes since they go through them so fast.